Kismet Record Company (sometimes also written as Kismet Records or Kismet Recording Company) was founded in 1938 in New York. After certain decline in 1970s, the company was revitalized. Kismet operated until late 1990s. 107  Rhechaniki (actually it's Hrechaniki or Grechaniki). 147  La Rinka / Royal Empress Tango. Played by Ben Lambert and Orchestra. Called Old-time but actually sequence dances. 148  Teddy Bears' Picnic (Eva Three Step) / The Tango Waltz. Played by Ben Lambert and Orchestra. Called Old-time but actually sequence dances. 149  Russian Medley (Polka Koketka, Karapyet, Korobushka, Lezginka, Kohanochka, Lifting Polka, Red Poppy) / Kujawiak. Played by Kismet Folk Dance Orchestra. 150  Israel Medley (Harmonica, Sham B'Eretz Yisrael, Mayim, Hava Nagila) / Czechoslovakian Dances (Clapping Polka, Andulko). Played by Kismet Folk Dance Orchestra. 151  Scandinavia Medley (Hambo, Swedish Varsouvienne, Norwegian Polka, Danish Paris Polka / American Medley (Lili Marlene, Hot Pretzels, Laces and Graces, Jessie Polka). 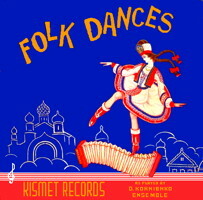 Played by Kismet Folk Dance Orchestra.